Working with National Poly Industries provides you the benefit of dealing direct with a manufacturer who is both established and professional. Our expertise, in-depth experience and success comes from over 100 years of combined knowledge and state of the art manufacturing facility. All products are designed to the highest standards and to meet your requirements whether for household, industrial or rural application. Best of all our prices are highly competitive, and we take pride is truly offering you a friendly, personal and dependable service before, during and after a sale. All National Poly Industries water tanks are manufactured from the highest quality, locally-sourced material to ensure maximum protection from harsh Australian conditions. Our rainwater tanks meet Australian Standards for food contact and drinking water. We are an ISO9001 certified company meaning you can be assured of all standards claimed in our manufacturing process. The polyethylene used in the manufacture of our water tanks is UV-stabilised. This provides maximum protection against the sun, ensuring your water tank will retain its original colour and strength throughout its lifetime. 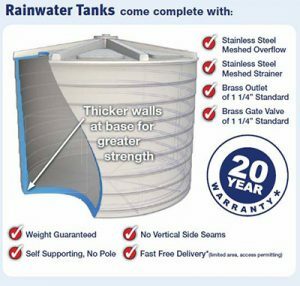 Finally, since we manufacture our own water tanks, we can provide you with a fast, dependable service and a generous warranty that we personally stand behind and will last.